FOXBusiness.com’s Kate Rogers with AnchorFree co-founder David Gorodyansky on how his company is protecting connections on the web for its 200 million users worldwide. One person that may be thankful to Edward Snowden for uncovering the NSA’s massive spying program this past summer is David Gorodyansky. With Americans increasingly concerned over their privacy on computers, tablets and phones, the co-founder of AnchorFree has seen his business boom over the past year. 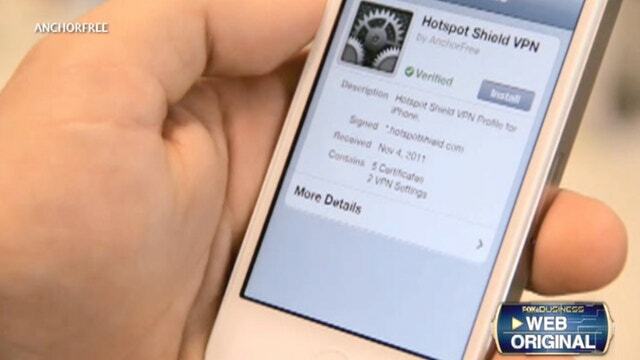 AnchorFree promises to protect user anonymity on the web via its application Hotspot Shield. The app for android and iOs encrypts everything consumers do on the web so that third parties can’t spy on them. And so far 200 million people in 190 countries have decided to “lock” their Internet activity down via AnchorFree. And Gorodyansky says this is just scratching the surface of potential users across the globe. “Our mission at the highest level is to provide secure connections to the seven billion people across the globe,” he says. The company was founded in 2005 with the initial idea to make Facebook (NASDAQ: FB) and e-mail connections as secure as online banking sites. Today it has $63 million in funding from Goldman Sachs (NYSE:GS) and 65 employees in its Silicon Valley headquarters, according to the company. And while it is growing fast with 250,000 new users daily, Gorodyansky says this is sustainable so long as education about online privacy continues to be promoted among the general population. He counts government officials and celebrities among the app’s users, but wants to reach the average consumer to make them aware of what is at risk when using unsecure Wifi connections, for example. The company’s fastest growing market is mobile, Gorodyansky says, with Android coming in the top spot. And next up in 2014 is potentially developing a platform that other apps like Dropbox and Evernote can use to run secure connections on for users. “We want to make everything you do on the Internet secure and private,” Gorodyansky says.